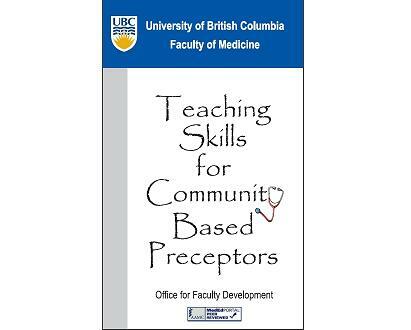 Teaching Skills for Community Based Preceptors is now available in cIRcle, UBC’s digital repository! This is a short booklet developed by the physicians in the Office for Faculty Development. It was designed to help faculty to teach more effectively in the clinical setting. The content reviews principles and practical tips for preparing to teach, teaching around patient cases, giving effective feedback and evaluating students. It reviews many practical teaching skills such as: orientation of the learner, task specific teaching, the one minute preceptor, the OPEN model for providing feedback. The booklet can be read in approximately 20 minutes or one can flip through the quick tips for a brief overview of the principles. What is an effective clinical teacher? A handy “Clinical Teaching Survival Guide” and a “Competency Teaching Checklist for Clinicians” are also included in this booklet. To access, download, and/or create a permanent link to this booklet on your blog or website, visit cIRcle at: http://hdl.handle.net/2429/26718. Note: It is approved for Creative Commons Attribution-Share Alike 3.0 License (click to view license details). For any additional information about this booklet and other similar teaching resources from the Faculty of Medicine, visit the Office for Faculty Development. Above excerpt in italics is courtesy of Office for Faculty Development.